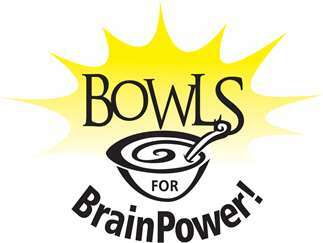 The ninth annual Bowls for BrainPower is set for Thursday, April 11 from 11 a.m. to 7 p.m. in the upper level of Diamondhead Education Center, 200 W. Burnsville Pkwy, in Burnsville-Eagan-Savage School District 191. This annual fundraiser supports BrainPower in a Backpack, a largely student-supported community service program providing weekend meals to preschool, elementary and middle school students in need. BrainPower, which is funded entirely with donations, currently sends food home with more than 775 children each weekend during the school year in District 191. Like in past years, attendees of Bowls for BrainPower may make a free-will donation and receive a simple meal of soup and bread, along with a handmade pottery creation as a reminder that children in our community face empty bowls every day. The event has raised more than $100,000 to support BrainPower in a Backpack since its inception in 2009. More than 800 beautiful pottery creations made by community volunteers and District 191 students will be available at the event. The goal this year is to raise more than $15,000. 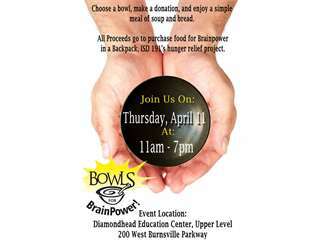 Donations to BrainPower via District 191 are tax deductible, and all proceeds are designated to purchase food for BrainPower in a BackPack. Bowls for BrainPower is a collaboration between the Burnsville High School Art Department, District 191 Community Education Youth Services Program and District 191 Elementary and Middle School Art Teachers. BrainPower in a Backpack, which relies on Burnsville High School students and community volunteers, serves all District 191 preschool, middle and elementary schools including Early Childhood Special Education, and Early Childhood Family Education.